Exhibition by Daniel G. Andújar, Pedro G. Romero and Sitesize. Curator: Valentín Roma. The Museum of Jewish History will house a part of this exhibition, which is organized by Bòlit Centre of Contemporary Art. Girona, bringing together three artistic projects which participate from different perspectives in the same strategies of transversality, antagonism, supplanting and interference. 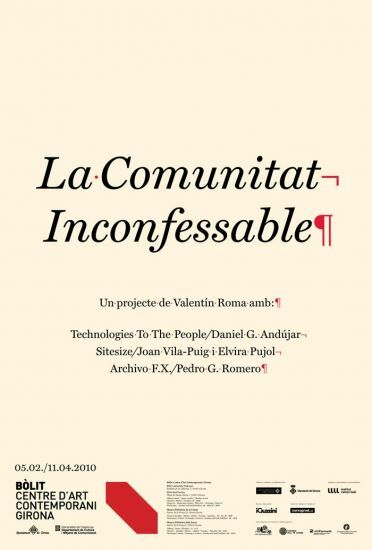 The exhibition proposes the exploration of the forms of social intervention adopted by artistic practices that develop around the idea of what constitutes a community, and which analyse the tension point at which art and community try to connect. It is divided into three different working approaches, one of which is an exhibition distributed between various premises around the city. The exhibition rooms of the Museum of Jewish History will house the installation designed by Pedro G. Romero, Archivo F.X..